Joining Spin Master’s popular Zoomer range of toys is Zoomer Chimp. This clever little fella has an incredible selection of over 100 tricks he can perform, as well as the ability to react to his owner’s voice commands. 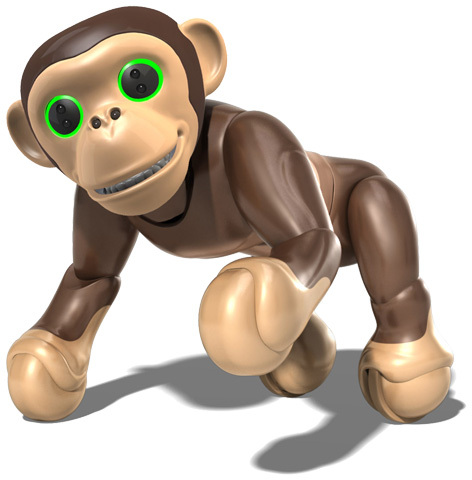 Colour changing eyes add to the fascination of this interactive walking, talking toy primate. The articulated mouth is one of the ape’s most impressive features, and with a separate set of moving teeth inside, the expressions he can pull are almost limitless. Chimpanzee screams are particularly realistic especially as he gets near the intended recipient! Rolling, sitting and standing are just three of the movements Zoomer Chimp can make from almost any other position, and when he stick his bottom in the air kids just roll around the floor themselves in fits of laughter! Robotic toys get more sophisticated and interesting every year as technology progresses. Zoomer Chimp is one of the finest we’ve ever seen and is sure to be on millions of kids wish lists. Please tell us what you think of the Zoomer Chimp by Spin Master.